CHICAGO (WLS) -- Chicago police have issued an alert after three armed robberies of taxi drivers by someone posing as a customer. 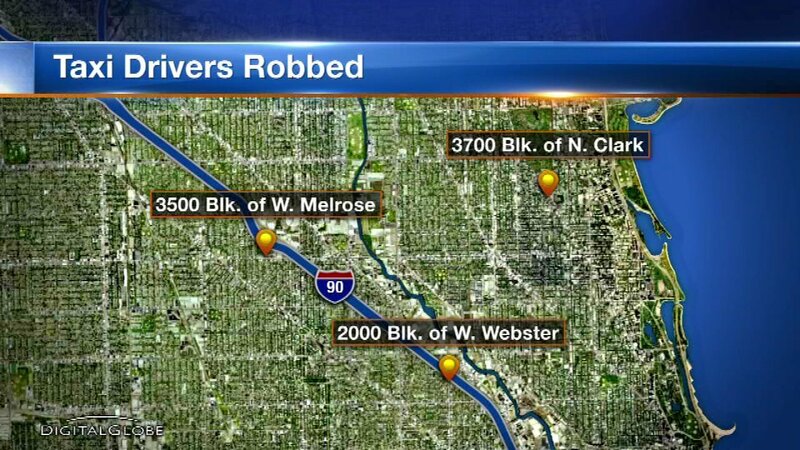 The first robbery occurred at 1:25 a.m. Friday in the 2000-block of West Webster Avenue, the second at 3 a.m. Friday in the 3500-block of Melrose Street and the third at 1:20 a.m. Saturday in the 3700-block of North Clark Street, police said. Police said the robber was picked up by the victims as a fare and announced the robbery after arriving at the destination. The suspect put the drivers in a headlock. In two cases, he was apparently armed with a hand gun and in the other had a large knife, police said. The robber made off with money and cell phones from the victims, police said. Police describe the suspect as a male Hispanic, 5'07" - 5'09", 150-160 pounds, clean shaven, wearing a black baseball cap, black hooded sweatshirt, and blue jeans. Anyone with information is asked to contact Area North Detectives at (312) 74408263.